This article was originally crossposted on Global Research in April 2018. The first two concern Israel. Although Britain regards Israeli settlements in the occupied territories as illegal, in line with international law, it permits trade with “Israeli” goods from those illegal settlements and does not even keep a record of imports into the UK from them. Yet UN Security Council resolutions require all states to “distinguish, in their relevant dealings, between the territory of the State of Israel and the territories occupied since 1967”. Israel’s blockade of Gaza is widely regarded as illegal, including by senior UN officials, a UN independent panel of experts, Amnesty International and the Red Cross, partly since it inflicts “collective punishment” on an entire population. Through its naval blockade, the Israeli Navy restricts Palestinians’ fishing rights, even firing on local fishermen, and intercepts ships delivering humanitarian aid. Yet Britain, failing to uphold its obligation “to ensure compliance by Israel with international humanitarian law”, regularly collaborates with the navy enforcing the illegal blockade. In December 2017 and November 2016, British warships held military exercises with their Israeli counterparts. “We’ve operated with several Israel Navy ships, practising communications and manoeuvring” and have a “great relationship with the Israeli Navy”, UK naval commanders have said. London’s claim is nonsense: It is arming, advising and training the Saudis and maintaining their aircraft bombing Yemen, many of which have targeted civilians, as the British government has long known. UN Security Council Resolution 2286 of 2016 also calls on all states to “end impunity and to ensure those responsible for serious violations of international humanitarian law are held to account”. Yet Britain is doing the opposite – it ensures the Saudis remain unaccountable by allowing them to conduct their own investigations into alleged war crimes. 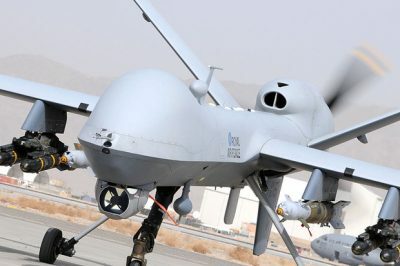 A fourth policy concerns the RAF’s secret drone war, which involves a fleet of “Reaper” drones operating since 2007 to strike targets in Afghanistan, Iraq and Syria. The UK/US spy base at Menwith Hill in Yorkshire also facilitates US drone strikes in Yemen, Pakistan and Somalia. The targeted killing of terrorists (and the use of force generally) is only lawful in self–defence or following UN authorisation, and thus the drone programme is widely regarded as illegal. When British drones killed two Britons in Syria in 2015, the government unconvincingly argued it was in “self-defence” to counter an “imminent attack”. Rather, as a House of Commons legal briefing argues, such strikes could set a dangerous precedent that other actors or organisations may follow. There is a good reason why the UK never admits to undertaking covert action. As the same House of Commons briefing notes, “assistance to opposition forces is illegal”. A precedent was set in the Nicaragua case in the 1980s, when US-backed covert forces tried to overthrow the Sandinista government. The International Court of Justice held that a third state may not forcibly help the opposition to overthrow a government because it would breach the principle of non-intervention and prohibition on the use of force. This means that Britain has been acting illegally in its years-long covert operation in Syria, and anywhere else it deploys covert forces without agreement from the host state. In the case of the Chagos islands, Britain has permanently violated international law since it expelled the inhabitants in the 1960s to make way for a US military base on Diego Garcia. Harold Wilson’s government separated the islands from Mauritius in 1965 in breach of UN Resolution 1514, which banned the breakup of colonies before independence. It formed a new colonial entity, the British Indian Ocean Territory. Last June, the UK was defeated at the UN when a large majority of countries supported a Mauritius-backed resolution to seek an advisory opinion from the International Court of Justice on the legal status of the Chagos Islands. In 2015, a UN Tribunal ruled that the UK’s proposed “marine protected area” around the islands – which was really a ruse to keep the islanders from returning – was illegal since it undermined the rights of Mauritius. The Chagos islands remain a UK-occupied territory. Finally, there is the 2011 war in Libya, for which British ministers remain unaccountable. While Tony Blair is widely accused of acting illegally in invading Iraq, UK Prime Minister David Cameron often escapes condemnation for the UK/NATO military intervention that overthrew the Gaddafi regime. Yet this war was surely a violation of UN Resolution 1973, which authorised member states to use “all necessary measures” to prevent attacks on civilians but did not authorise the use of ground troops – which Britain secretly deployed to Libya – or regime change. Indeed, Cameron himself told Parliament in March 2011 that the UN resolution “explicitly does not provide legal authority for action to bring about Gaddafi’s removal from power by military means”. This list of wayward policies is by no means exhaustive. The UK does not deserve its place on the UN Security Council when it is a consistent violator of the principles it is meant to uphold: It is like having a gangster as a judge. To call Britain a rogue state is not to take an ideological position so much as to describe a basic fact in current international affairs.